Goalkeeper Liam Flynn has left Stocksbridge and signed for Mossley to be closer to his home in Oldham. Pic: Peter Revitt. The home side ground share with Sutton Coldfield Town where they use the often-criticised 3G surface. Mid-table Romulus won 2-1 at Bracken Moor in September. But their form has slumped with the West Midlands outfit losing the last five on the spin in a six match winless run, which resulted in the departure of manager Dave Barnett with chairman Richard Evans taking over as caretaker manager. 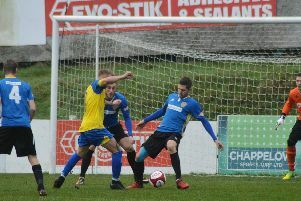 Hilton will hand a league debut to goalkeeper Sam Andrews after joining Stocksbridge from Brighouse Town following the departure of Liam Flynn to Division One side Mossley. The Steels boss is also understood to be close to landing two further signings in time for the trip to Romulus. Sheffield FC travel to Chasetown intent on building on an excellent 2-2 draw at promotion chasing Leek Town in the last outing. Manager Jordan Broadbent feels his team, 17th in the table, are in a false position. So it is down to the players to prove the boss correct by picking all three-points against a Chasetown side just below Club in the table, and where only goal-difference separates the teams. It certainly looks a game where Sheffield should be coming away with maximum points with the hosts going through a sticky patch which has seen the Staffordshire outfit lose four of the last five games. In the Premier Division, Frickley Athletic can continue their climb away from the relegation zone with a win over Stourbridge at Westfield Lane. Karl Rose side have lost just one of the last six which has seen them pull seven points clear of the bottom four. Stourbridge in 11th are still in with a shout of the play-off’s and arrive looking for a third win on the spin. Matlock Town take on relegation rivals Marine at Causeway Lane in what is the proverbial six-pointer. The Gladiators occupy the last of the four relegation spots with Marine just one place and three points behind them. Manger Mark Hume could hand a debut to winter Jamie McDonagh after the 18-yaer old signed on a month’s loan from Sheffield United. Third-placed Buxton will aim to keep up their promotion push by extending the run to four without defeat at Halesowen Town. Premier Division: Frickley Athletic v Stourbridge, Halesowen Town v Buxton, Matlock Town v Marine. Division One South: Chasetown v Sheffield FC, Romulus v Stocksbridge Park Steels.